I am seeing a strange behavior with Blender. Let me explain the detailed workflow of what I do. I use OBS studio to record my screen and audio. The output is produced in mp4 file. I edit the video in blender. Final step render the video to produce the final output. If I render the raw video in after effects/handbrake etc and use that file in blender to render the video again, it still doesn't work. Old videos are rendering without any problems. Update: The problem was occurring due to change in Output Quality setting. I changed it from "Lossless" > "Perceptually lossless". Browse other questions tagged blender-render video or ask your own question. What setting should I use to keep the same quality of video file? 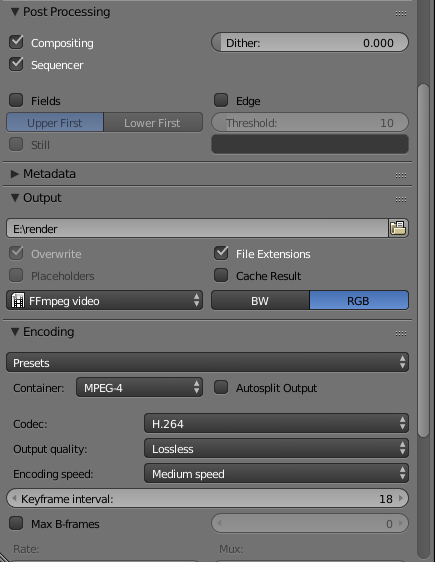 Rendering animation as stills or MP4?